There's nothing better than a calming soak in the tub with bath salts, especially if those salts come from Soulillume. 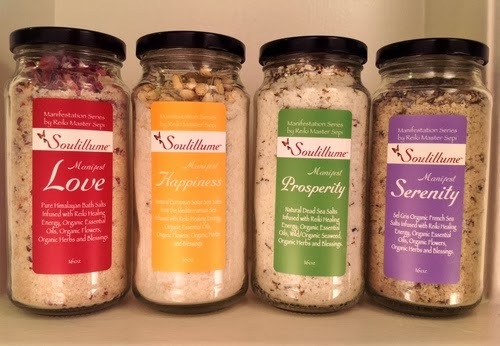 Each blend of Soulillume bath salts are made with only all-natural materials including Organic Essential Oils, Organic Herbs, Organic Flowers, Organic/Wild Seaweed and Himalayan Salt. But there is something extra in this product that you aren't going to find in any store bought items. Every batch of Soulillume is infused with the healing energies of Reiki. If you aren't familiar with Reiki, it's a natural form of energy healing. 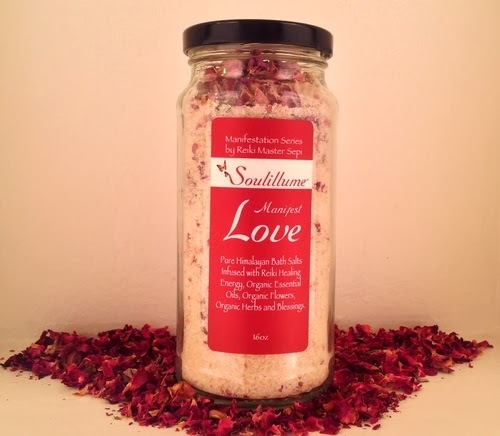 Every ingredient in these bath salt blends has its own unique healing property. Reiki is a positive form of energy that is channeled from the designer into the salts to help clear blocks on the physical, emotional, mental and spiritual levels and balance the chakras. This series of salts offers the blessings of Love, Happiness, Prosperity and Serenity. I received a jar of the Manifest Love bath salts to try out and I absolutely love them. The large 16oz bottle is a generous portion that will last for quite some time if used sparingly. Inside you'll find soothing salts as well as large pieces of flowers. The aroma is simply delicious and is only gets stronger once everything is dissolved into the water. Seeing the flower petals floating in the water adds to the luxury. But its the way you feel after soaking that is the true miracle. These bath salts do more than simply relax sore muscles. The natural healing energies of the ingredients, coupled with the Reiki energy, provide an invigorating lift in your spirits. And remember that Love isn't all about romance. There is also self-love and if you are feeling down or need a confidence boost, these salts are a gentle and inspiring lift for your soul. I love these salts! Manifest Happiness is amazing! I would love to try the serenity. I would like to try Manifest Serenity. I would choose Manifest Prosperity. Hope I win :) I keep hearing such great things. Can't wait to try them!